I have a love of books – in fact I have way too many books for the number of bookshelves I own. You see, the problem is that I also enjoy thrift shops and they’re the best places to find books at bargain prices. I have found some wonderful treasures at thrift shops, some of which I've had to rummage for through tatty, dusty piles – but that’s half the fun. I even got a lovely big book on fishing in Australia for free because the pages were a bit yellowed and they were going to throw it out! Of course, these are just the non-fiction books. In the last few weeks I have also bought several anthologies, a book by Eric Idle and the story of a soldier who became a deserter in the Iraq war. I’m just thankful that my one addiction is so inexpensive! -	Never judge a book by its tattiness – sometimes the tattiest ones are the most rare and interesting. 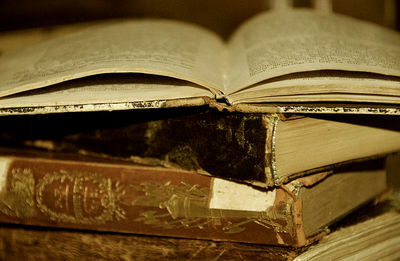 -	Never assume that, because you like one book by a certain author, you’ll automatically like others by the same person. Read the blurb and make sure the subject matter is of interest. -	Check the publishing information on the title page. You may just discover a first edition - even better if it’s signed by the author. Of course, there are other places to find bargain books. There are still a few second-hand book stores around. You can also try market stalls, garage sales and library clearances. Even if you don’t find that little treasure, the enjoyment of being around old books is satisfying enough.